Michael D Higgins formally launches his presidential campaign in Dublin, vowing to dedicate his service as president to the welfare of all the people. Presidential candidates “experience and competence”, and “ability to represent Ireland at home and abroad”, not personality politics or scandalous stories of their past, will determine who will become Uachtarán na hÉireann. This is the view of Labour’s presidential candidate and former Galway West TD Michael D Higgins who believers the public “is interested in issues of real substance” and not any kind sensationalism as the State enters the final four weeks before polling day. With nominations now having closed, seven candidates will stand for election as President of Ireland - Mr Higgins, Sinn Féin’s Martin McGuinness, Fine Gael’s Gay Mitchell, and Independents David Norris, Mary Davis, Dana Rosemary Scallon, and Sean Gallagher. Recent opinion polls show Sen Norris with the most support followed by Messrs Higgins and McGuinness. However Mr Higgins is the most transfer friendly, leading many to the view the race as ‘Michael D’s to lose’. So far election coverage has concentrated on personality politics and some candidates past actions and deeds. Previous campaigns, particularly 1997s, became intensely personal, with much viscous comment thrown at the eventual winner Mary McAleese. 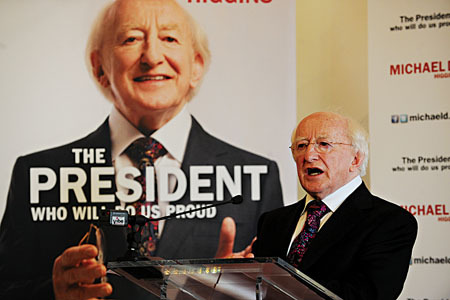 However Mr Higgins hopes the 2011 race will concentrate on “issues of substance” rather than on personality and name calling. Mr Higgins feels that now the field of candidates is fully known, the focus will turn towards their “experience and competence”.